Downtown Siloam Springs, Ark. Image: Feyerabend Photoartists. We’re home from Copenhagen but sharing some remaining thoughts from this month’s study tour. Confession time: When PeopleForBikes came to Copenhagen to lead a study tour mostly of officials from Northwest Arkansas, we wondered if Denmark’s lessons would be relevant. 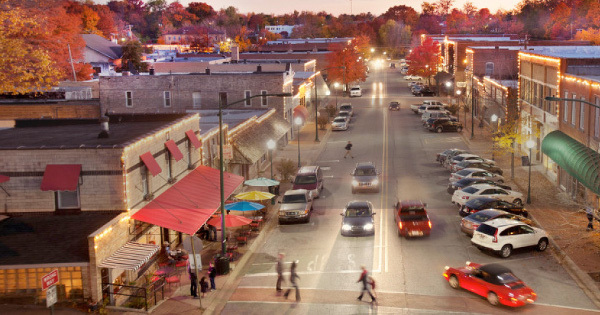 But though the setting was very different in one of the world’s bike-friendliest metro areas (population: just over 1 million) the vision of prosperous, happy, safe and pleasant cities was perfectly familiar to community leaders in Fayetteville, Bentonville, Rogers and the whole region. One of the most interesting perspectives came from one of Northwest Arkansas’s smallest cities. Meredith Bergstrom, executive director of Main Street Siloam Springs, was eating lunch on Sankt J?rgens S?, refueling between lectures, when she started thinking aloud about the potential for biking in the smallest cities. Because a small town is more likely than a suburb or even an urban neighborhood to have a little bit of everything within a short distance, Bergstrom said, biking could be a perfectly practical way to get around. Today, Bergstrom said, Siloam Springs’ lack of bike infrastructure means that bike transportation just doesn’t happen much. Bergstrom ticked off the possible destinations that bike infrastructure could open up. Small towns don’t have fewer challenges than big cities, only different ones. But sometimes, they can have some of the same solutions.